In response to thousands of Atheists gathering on the National Mall last Saturday to rally for secularism at the 2016 Reason Rally, leading evangelist Franklin Graham pointed out the irony behind the demonstration. Atheist activists, entertainers and performers took the stage in front of the Lincoln Memorial on Saturday to rile fellow atheists and religious "nones" to call on politicians and governments to take "reason" as priority over "religious-driven ideology." Graham, the president of the Billy Graham Evangelistic Association, took to his Facebook page Monday to argue that "freedom-loving" Americans should be concerned by the "liberal godless kind of reason" being promoted at the rally. Graham then wrote that it is "ironic" that the gathering was held on the grounds of the Lincoln Memorial. "Isn't it ironic that they met on the grounds of the Lincoln Memorial where these words are engraved in stone: 'We here highly resolve that these dead shall not have died in vain — that this nation UNDER GOD shall have a new birth of freedom,'" Graham asked. "President Abraham Lincoln acknowledged the inherent role God plays in establishing our rights and freedoms and so did many of our founding fathers." Although there is some dispute about Lincoln's faith, author Cristobal Krusen writes in his recently released book They Were Christians: The Inspiring Faith of Men and Women Who Changed the World that it was a covenant with God that led Lincoln to free the slaves with the Emancipation Proclomation. According to the book, the agreement was if God gave the Union one decisive battle victory in the Civil War, Lincoln would free the slaves. Despite the fact that Lincoln was a known skeptic of religion, Krusen writes that Lincoln began to ponder and embrace Christianity after the death of two of his children and often prayed to God during moments of distress during his presidency. In his blog post, Graham, who is also the president of the humanitarian organization Samaritan's Purse, urged Christians to pushback against the secular agenda by continuing to evangelize in the "ever-growing secular world." "Now these atheists promoting secularism want to strip God out of America's past, present and future," Graham added. "Here's a warning — If you remove God, you remove God's hand of blessing. That's been shown over and over throughout history." "One day each of these people is going to stand before the God that they disown, and they will face an eternity in Hell if they have not trusted Christ as their Savior," Graham added. "That's where this kind of 'reason' will get them. The Bible says, 'There is a way that seems right to a man, but its end is the way of death,' (Proverbs 14:12)." Even though the rally featured famous atheists like Bill Nye the "Science Guy," comedian Lewis Black and rap group Wu-Tang Clan, multiple reports suggest that attendance was considerably lower than the 30,000 people that organizers expected, with only a few thousand showing up. Hemant Mehta of The Friendly Atheist blog believes that the lower-than-expected turnout at the 2016 rally was due in part to the fact that no devoutly religious candidate remains in the 2016 presidential election who would threaten atheists and cause them to unify. Mehta opined: "While religious groups still have plenty of power, we're currently in the midst of an election where Donald Trump, Hillary Clinton, and Bernie Sanders really don't talk ad nauseum about their faith. They all claim to be religious, but I'm not worried about any of them making decisions based on the voices in their heads. Even Trump's bone-headed ideas aren't idiotic for religious reasons; they're just bad ideas, period. "(Question: If Ted Cruz had won the Republican nomination, would the Reason Rally crowd have been larger? My guess is yes.)" 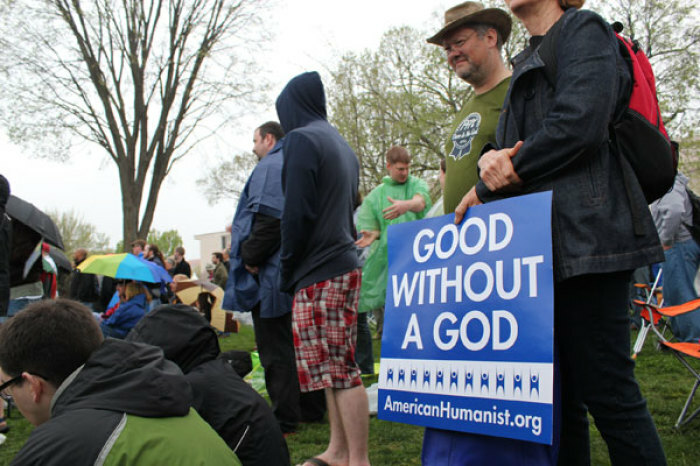 Atheist Reason Rally Is 'Invasion,' of 'Good for Nothing' People, Says Catholic League Pres.